We’d love your help. 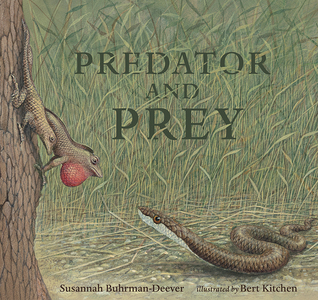 Let us know what’s wrong with this preview of Predator and Prey by Susannah Buhrman-Deever. Who is the predator, and who is the prey? Illuminating poetry and vivid artwork capture the awe-inspiring ways that creatures use their resources to stay alive. Who wins, the assassin bug or the spider? The bat or the frog? The ant or the honey bee? The male firefly . . . or the female? The battle for survival between predator and prey is sometimes a fight, sometimes a danc Who is the predator, and who is the prey? Illuminating poetry and vivid artwork capture the awe-inspiring ways that creatures use their resources to stay alive. To ask other readers questions about Predator and Prey, please sign up. Susannah Buhrman-Deever is a biologist with a PhD in animal behavior from Cornell University. In addition to her academic work and writing, she has developed inquiry-based ecology curricula for children. Predator and Prey is her first book for children. She lives with her family in upstate New York.